When I buy new patterns for knit tops or t-shirts the number one criterion for the purchase is that the pattern has to have something distinctive. It needs some detail that makes me want to sew it and wear it. A plain tee is just not going to catch my interest or my pattern dollars. 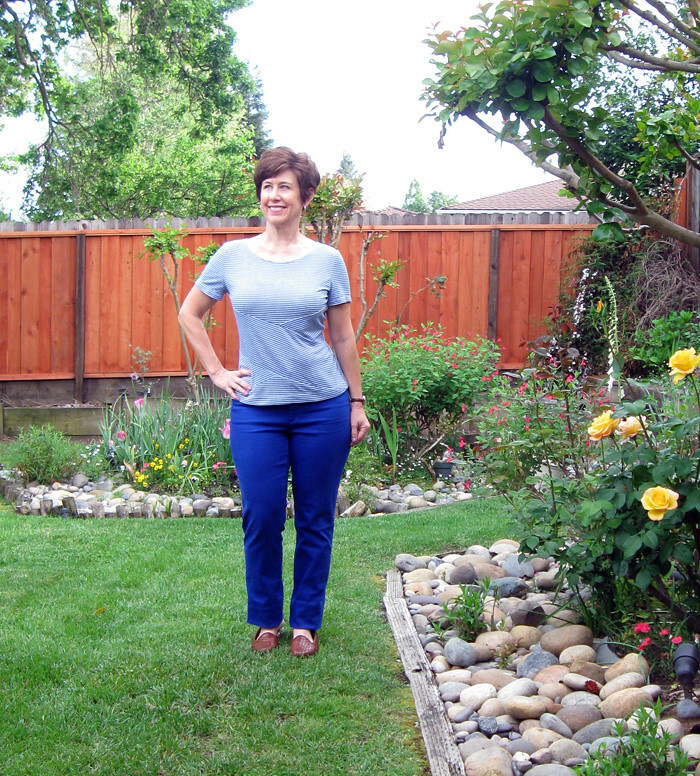 I am kind of amazed at how many knit tee shirt patterns are circulating around the sewing world lately - that all look the same to me. How do you decide which one to buy and sew? and why make such a plain item? But of course that is the beauty of sewing - you can make exactly what you want and what appeals to your personal taste. 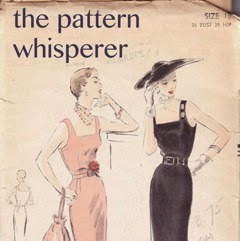 So when this pattern came out I bought it right away, I think the example dress on the pattern envelope looked so good to me - it has a lot of energy, if you could say that about a dress. So I sewed up the top to try out this pattern and it's pattern love on this one. Although the details don't really pop with this fabric. Which I had in my stash and seemed like a good bet for a first version, to work out the details and see if I liked the neckline and fit. So far so good for this first version! I really like the shape of this top - fitted but not too much so. And the neckline, shoulders and sleeves fit really well. Lately the fit of the size 12 of Vogue and McCalls has been spot on for that crucial area. 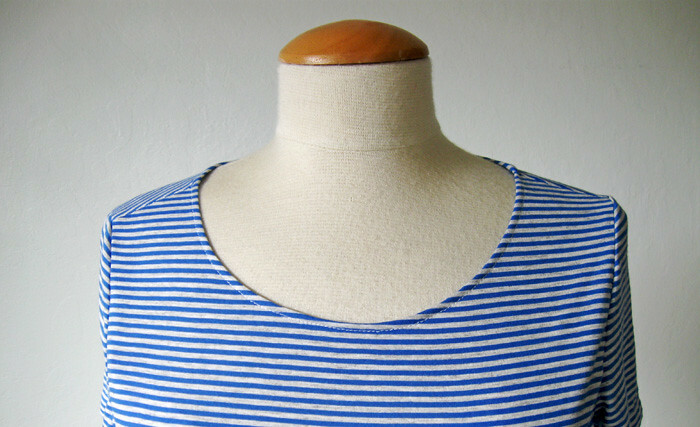 Not too wide in the neckline - something that drives me crazy (usually I find that in Simplicity patterns designed for wovens). In any case - I did do some pattern fitting before I even cut out the top. Because I looked around the web at other versions sewn up and I think that on most women the seamline crosses the bust at not quite the right spot. (too high, bisecting the apex of the bust). 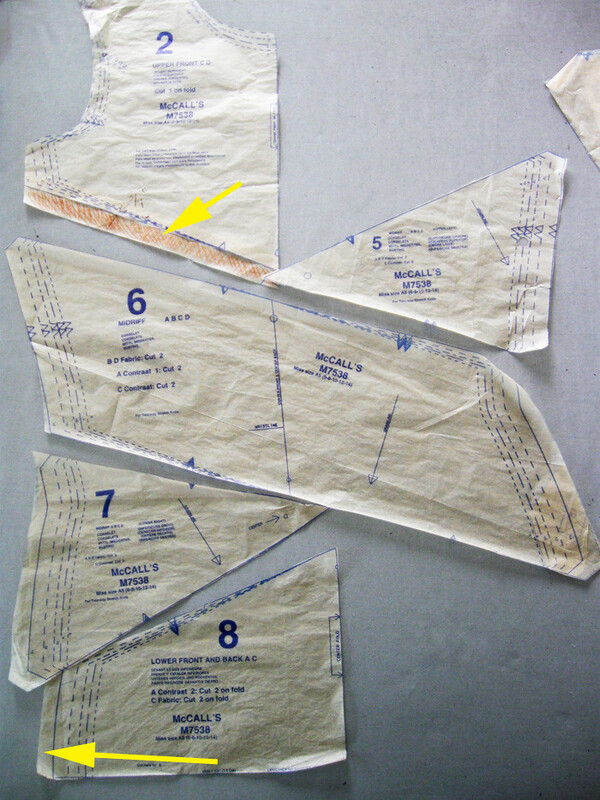 Top yellow arrow, showing the extra 3/4" added to bottom edge of Pattern Piece # 2. Bottom yellow arrow, showing that I added 1/2" to the hip area (also on back pattern pieces not shown). I always add a bit in the hip and then can take away later if need be. 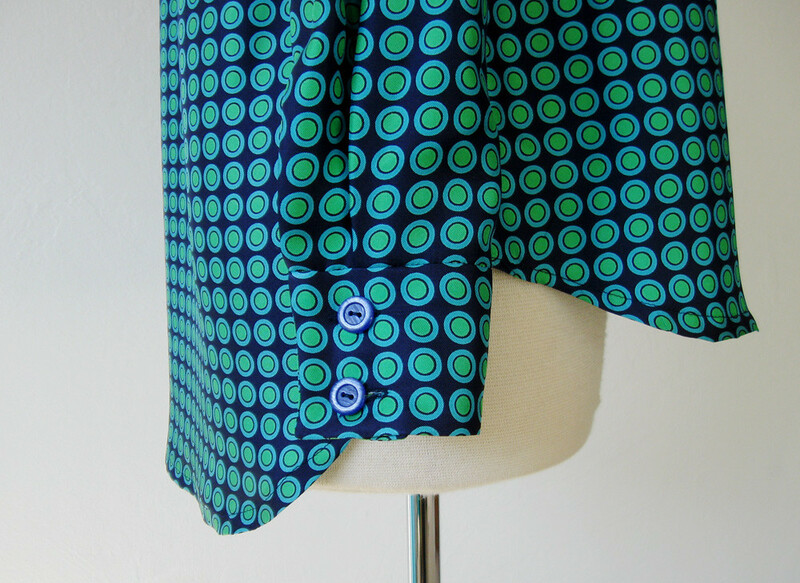 One thing to note about this pattern is to sew the segments in the order that they instruct. I wasn't paying attention, just started attaching them together and thought how can I sew that corner of piece number 8 into the triangle created by 6 and 7? But no - if you follow the directions you actually end with straight seams to connect - which is much better! So even though I say that I never look at the instructions that is not completely true. Usually when I am zipping along and then hit a point where I think "oh this is stupid'. So I read the instructions and find that it's me that is being a bit dense and they have worked it out much better! Here's the pattern envelope. McCalls 7538. I really like the dress version and have some striped knit that might be just perfect for that. I was thinking about doing the V-neck version in a variety of scraps of striped fabric - which may look like a clown outfit or could be very cool. Time will tell. Here's another place where I decided to follow the directions and am pleasantly surprised. I do NOT like knits where the neckline is turned and stitched. For some reason that seems so...um....basic to me. Like I'm sewing my own clothes but I will make the minimal effort. Harsh? Hey everyone has a details or two that they can't abide and that is one of mine. But for this semi-tester version I gave it a try (meaning I wasn't going to be heartbroken if this top didn't look great since the fabric was one of my $2 sale bargains). And it came out nicely. I think this technique doesn't work on all knits - they have to have enough stretch to turn the round edge but not too much that they stretch out. If that makes sense! 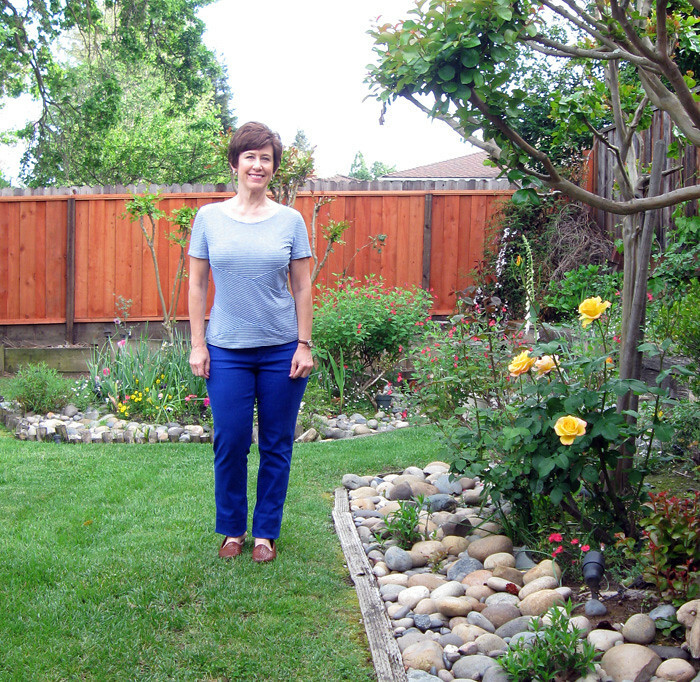 Am I shrinking or are patterns getting longer? I think the trend is for longer tops, even in t-shirts. I hemmed it and then decided it was too long so very lazily turned up the hem again and stitched to shorten it another 1.25". So the hem is a bit bulky. But now I know for the next version. You can see on the dress form that adding the 3/4" of length on the top piece means that the seam does go under the bust point which I think looks optimal. 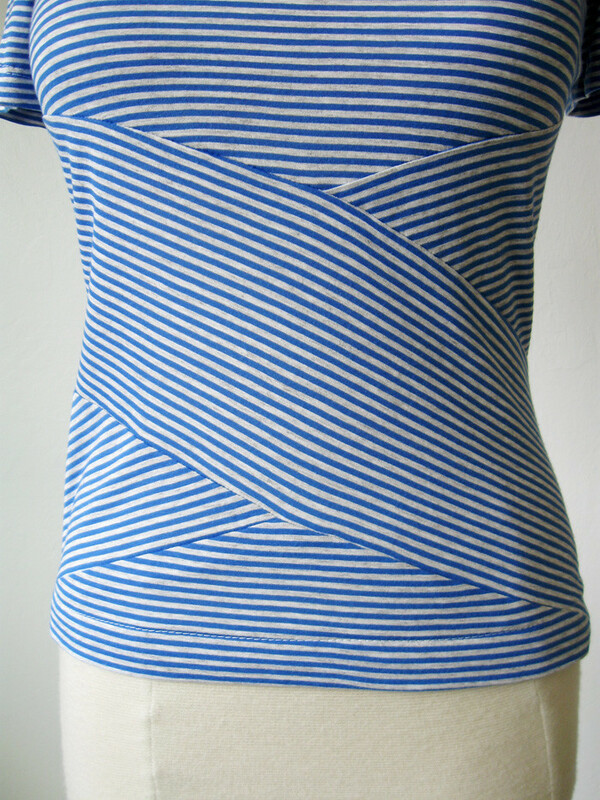 Plus the diagonal seaming/stripes create kind of a slimming effect, which is fine with me! And don't you miss the pink jasmine on the back fence, I'm so sad to lose it however today is a plant sale at the local junior college horticultural department. So I plant to stock up on lots of new stuff that I will then have to find a home for in my yard. 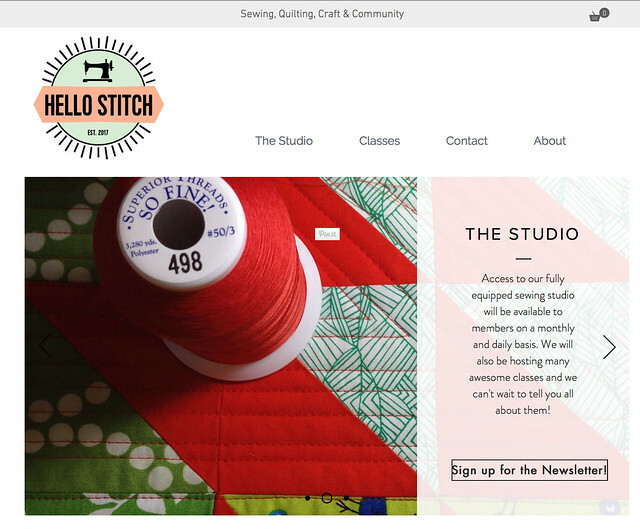 Hello Stitch Studio in Berkeley where I will be teaching sewing classes is now open! Some lovely photos on the space now online to view. You can register on their website for memberships and sewing classes. You don't have to be a member to take the sewing classes so I hope to meet some of you there. My first classes: Sew a Tunic top (morning) and Sew a Skirt (afternoon) start on May 13 and there are a few spaces still available. Up next, I'm sewing a couple of items for myself in some beautiful cotton voile. Love that fabric! And working on various projects for sewing clients - with some interesting features that I will blog about. Today's garden photo - you can see the gorgeous yellow rose in the pictures above that is at its best this time of year, but the star this week is the orange tree. 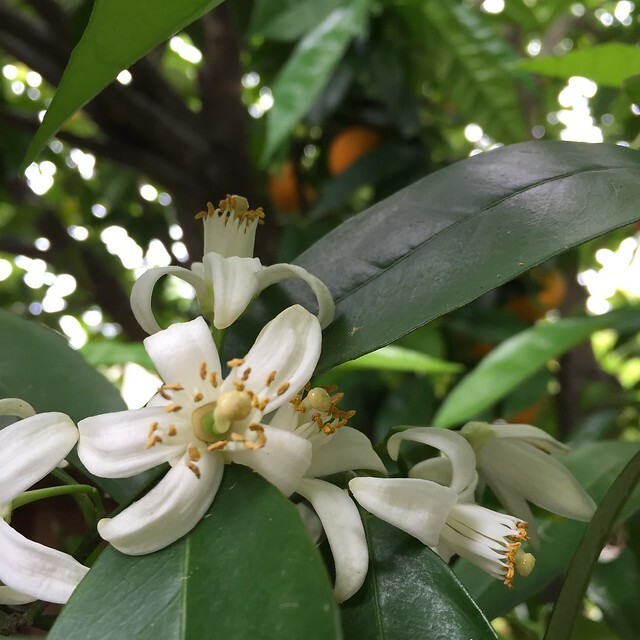 In full blossom, covered in bees doing their job of pollination and the orange blossom scent is intoxicating! What season is it? As is typical here in the bay area we had a burst of glorious warm weather - sunshine, temperatures where I live around 80˚F a week ago. I know this for a fact because I went to buy some heirloom tomato plants at a master gardener sale. The line was long and the sun was intense. I went in the morning - decided there were too many people and I didn't want to spend a glorious Saturday morning standing in line. So I went on with my other errands, had lunch and then around 1:30 decided to go by there again. Eureka! No line and they still had some of the varieties that I wanted. But as for planting - the area wasn't quite prepared and I've been in the midst of having a fence rebuilt which also involved tearing down my lovely pink jasmine. It will grow back, or so I hope. So the vegetable patch is still a work in progress and in the days following the great tomato score the skies have opened up. A crazy rainstorm! The poor shivering tomato plants wonder what is happening and so do we all. April showers, right? That brings up the question of what to wear. Not really summer clothes weather, not yet time for shorts or floaty summer dresses. 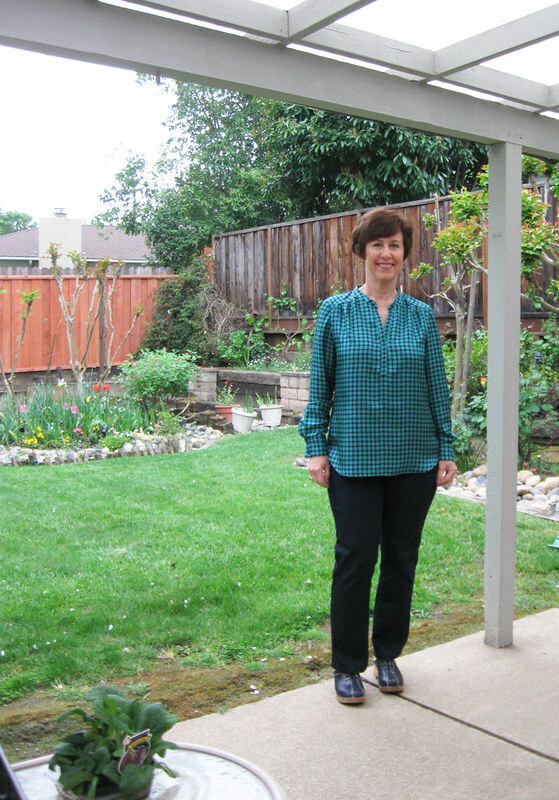 As it happens I had started making this silk twill shirt and find that it is just right for those transitional seasons which we briefly have here. Although my usual caveat - if you are visiting the bay area our microclimate weather could mean arctic by the ocean and sweltering 10 miles inland. Visitors you are warned! It was raining when I took this picture so that's why I taking refuge under the patio cover. And you can see the new fence:) minus the lovely pink jasmine which was just starting to bloom :(. We are a fenced-in bunch here in CA. I was amazed when ages ago I went on a business trip to N. Carolina and saw all the houses and not a fence between them. 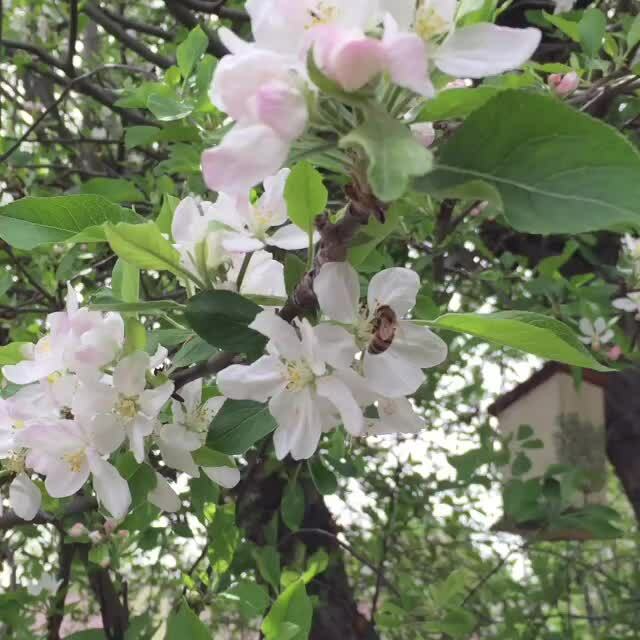 Plus it was spring and everything was in bloom, I thought it was lovely. I did ask my hosts how everyone kept their dogs in their yard but I don't recall the answer. Where I live there are so many swimming pools and it's the law (for safety) that they have to be fenced. Anyway - back to sewing. This top is a silk twill which I actually had some doubts about as I was sewing but now that it is completed it's dreamy to wear. Very floaty, but with substance if that can be a thing. I bought this fabric at Metro Textiles in New York last October and after making this I have about 1 yard left. I saw the same fabric on the Gorgeous Fabrics website, here's the listing. 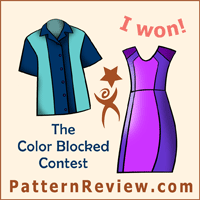 Here's the pattern envelope and drawing. I made this top previously, also in silk and in green which is a funny coincidence, and both of my versions look so different from the envelope version. That looks boring and a bit frumpy. (that dark blue lace, blech) My previous version is here. I love this top and have worn it a lot. 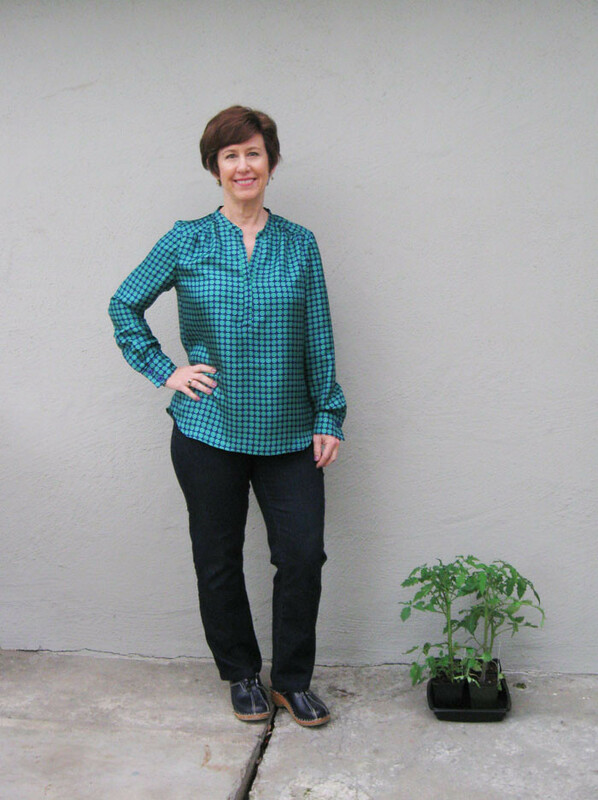 My and my shivering tomato plants. Sewing-wise I don't have much to say about this pattern, it is a bit fiddly to sew, at least that skinny placket is but the instructions are very clear and if you follow each step it should be perfect. If you haven't done a placket like that before I would suggest a first try with a nice well behaved cotton. This silk twill is super slippery and wants to leap off the sewing table at every opportunity. But that's what makes it very comfy to wear. 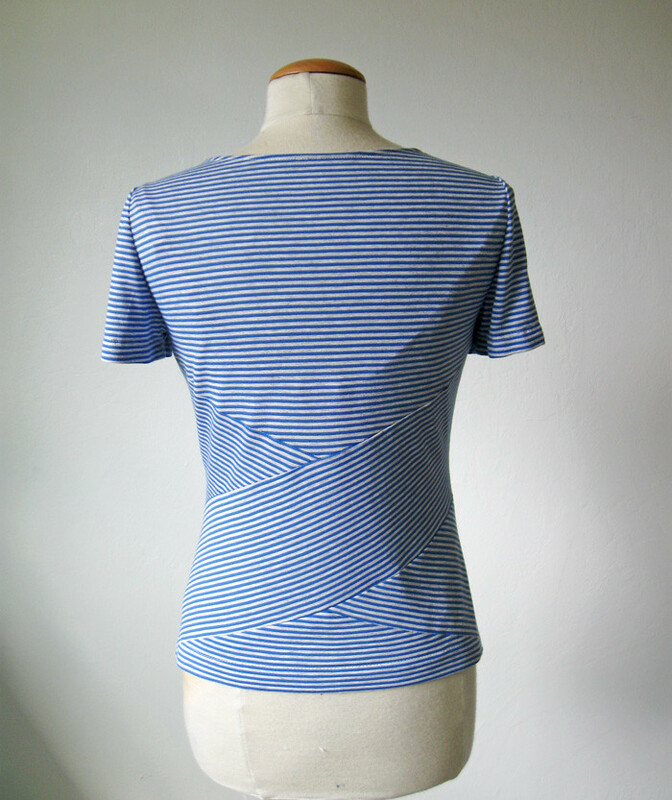 I cut out this version to the length the pattern specified, as I couldn't do that when I made the first stripe version due to minimal fabric, but this seems a bit long in the back. So since I took the photos and wore it once I shortened the back about 1.5 inches. It still has the hi-lo hemline but just not so long in the back. 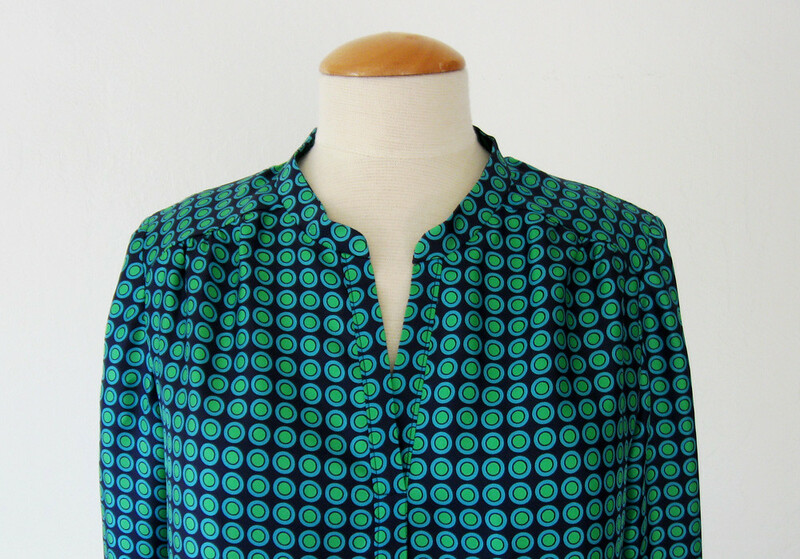 I tried to match the dots on the placket but maybe not so well. I think this is a thing that sewing people might see but nobody else will. This image is probably the best representation of the actual color. I made the sleeves full length and added a regular shirt cuff. 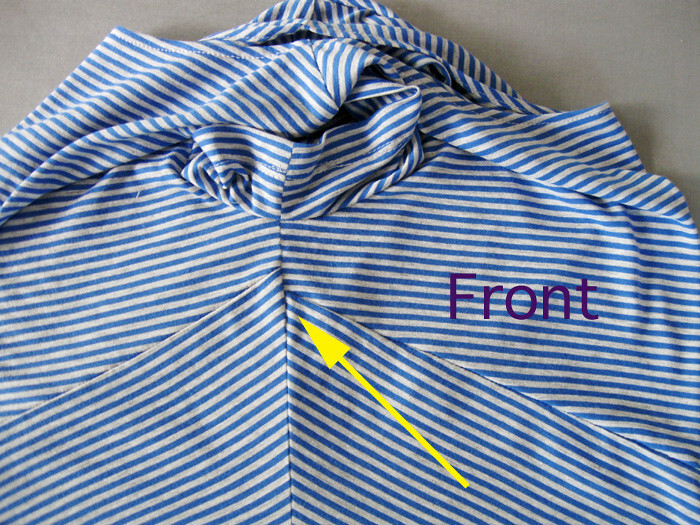 For the opening I did a continuous placket which is softer and easer on this type of fabric. So that's the latest scoop on what I've been sewing. 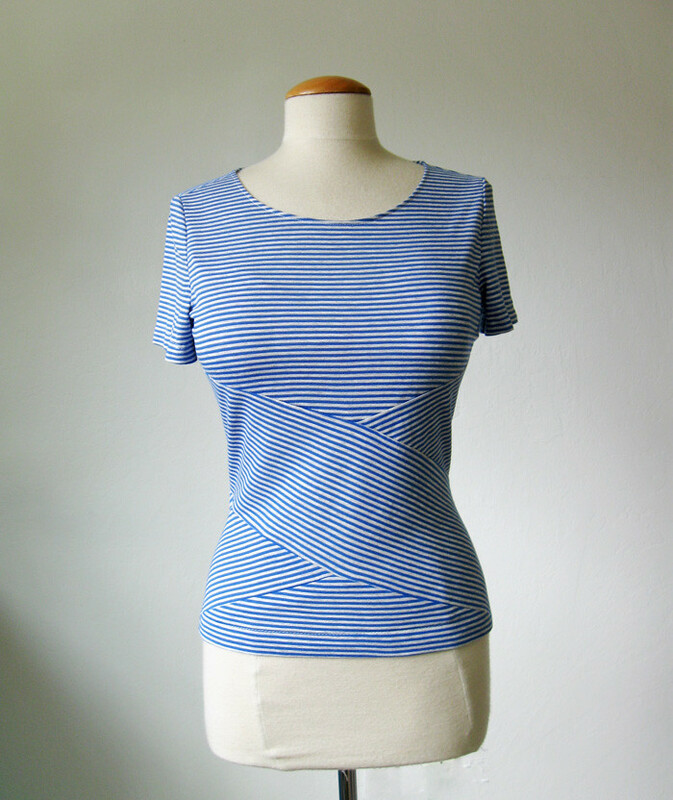 And while I have one quick knit top which I just completed for myself (pattern love! McCalls 7538) my other sewing recently is for other people. 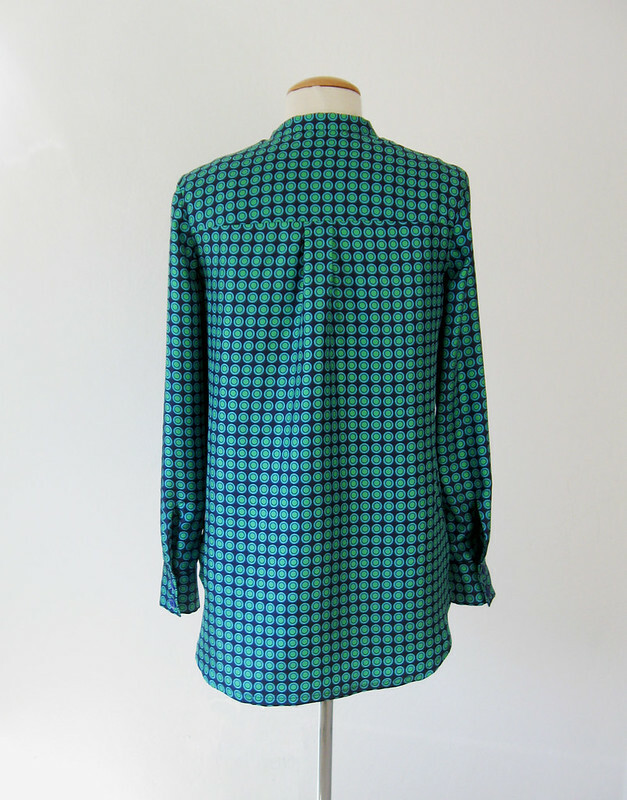 Including a coat in plaid (eek) which I will share. 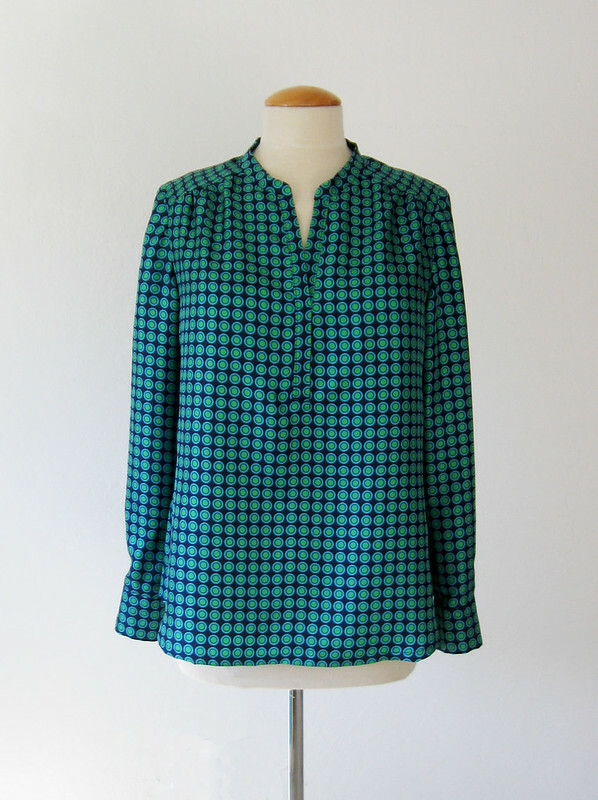 And a silk charmeuse blouse (also eek). These tricky fabrics! Thank you for all the kind words my last post - where I mentioned that I will be teaching sewing classes at a new studio in Berkeley: Hello Stitch Studio. We are getting sign-ups at a steady pace so if you are interested check out the website and reserve your place in the class. Here's my garden photo for the day - under the apple tree which is in full bloom and making a carpet of pink petals. And despite the rain still covered in flowers. The prolific nature of this old tree amazes me. And the flower petals look like snow when the wind blows. So pretty! I'm teaching classes at a new Studio ! Hello Stitchers! I couldn't resist opening with that greeting as I am happy to tell you that I will be teaching classes at a new studio opening in Berkeley starting in May. 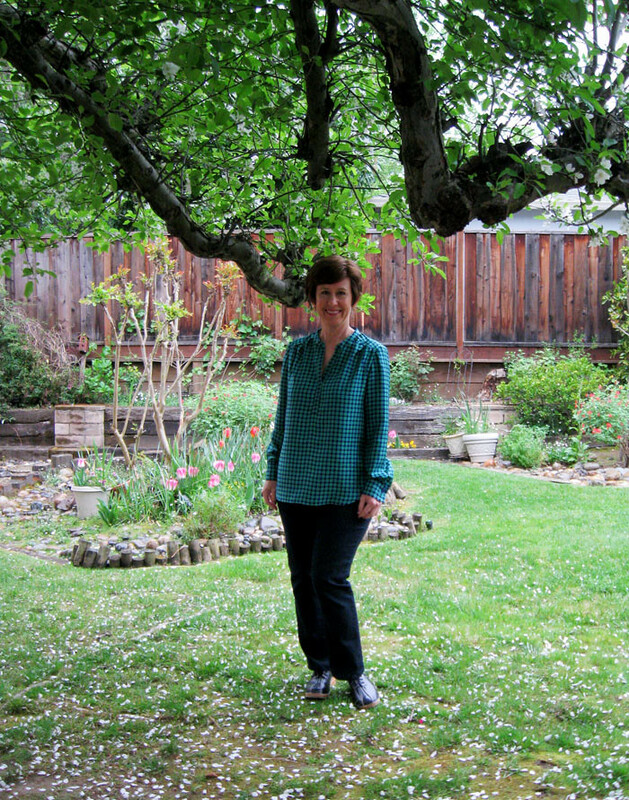 Hello Stitch Studio - a fully provisioned sewing and quilting studio located in Berkeley CA. I'm so excited to have this opportunity and will start with a few different garment basics classes as well as a fit lab class. Coming up in the future are classes for a button front shirts, jeans and of course coats/jackets! It is a fully equipped studio so no need to bring machines or equipment (although you are welcome to bring your own to use). The owners are quilters as well as sewers so the studio will have something for everyone. Here are the details on the classes for May and June. The Tunic Top class and Skirt class have two different sessions scheduled. On the website the class listings have more descriptions of what I will be covering such as choosing your size, seam finishes, and even how to make changes in the pattern to make it just right for you. Fit Lab - Fit a pattern just for you. 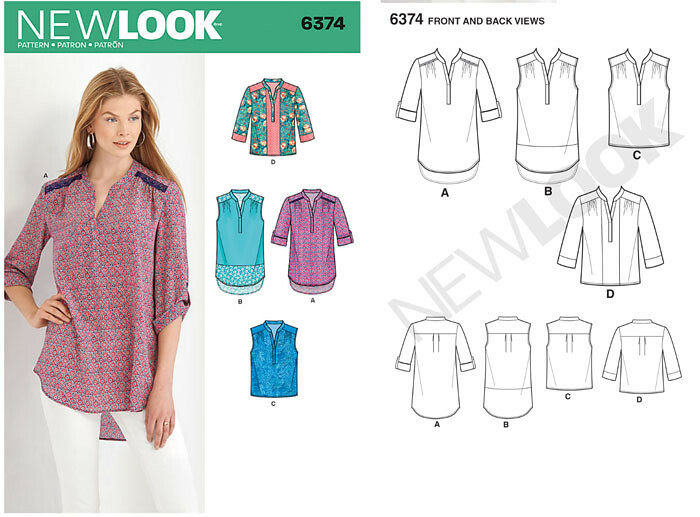 For the garment classes details on on the website listings, I have suggested specific sewing patterns, choosing an indie pattern option as well as a Big 4 pattern but if you already have a pattern for a tunic top, skirt or shift dress I'm sure that will work. Also when you register we will provide info on what to bring and prepping your fabric before the class. 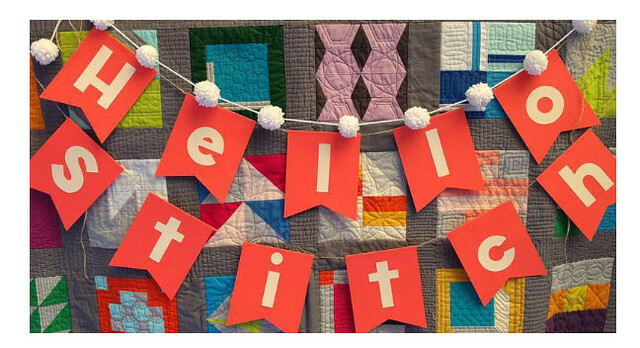 "Hello Stitch is a creative studio in Berkeley CA that specializes in quilting and sewing. Owners Stacey, Kristen and Terri wanted to create a space where people can be inspired to sew and create things by hand. We believe that working with textiles can serve as an outlet for expression and a way of life. A way for people to feel better about their lives. By providing a variety of classes and sewing machines to rent, we hope to excite people new to the craft as well as experienced crafters." Sign up for their newsletter to get updated on all the classes and details. We'll be scheduling more classes for the coming months as well. The studio is located on University Avenue, a few blocks down from Shattuck (walkable from the Berkeley Bart Station). Classes are available to anyone and the garment classes come with 2 hours of studio time so you can arrive early or stay after to continue working on your item. They offer membership so if you want to sew with others, get a discount on classes or need a fully equipped sewing space that is available. That info will be on the website in the next few days. If you have any questions feel free to email me (the link to email me is at the upper right under my profile pic).